We visit a haunting corner of the Roman fort, the site of London’s amphitheatre and the elegant Tivoli corner of the Bank of England. 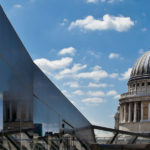 We take in the grand home of the Lord Mayor – inspired by Palladio – the Royal Exchange, influenced by the Pantheon, (now home to sumptuous shops and restaurants) and we finish at One New Change with fabulous rooftop views of St Paul’s Cathedral, Wren’s answer to St Peter’s Basilica in Rome. Dieser Stadtrundgang wird auch auf Deutsch angeboten. Questa visita guidata viene anche effettuata in Italiano. What do Michelangelo and Henry Moore have in common? 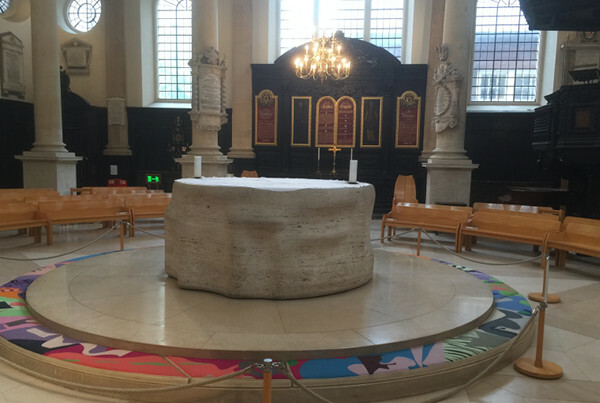 Henry Moore sculpted the altar of St Stephen Walbrook using marble from the same quarry (Travertine, near Rome) as Michelangelo used for the ribs on the outside of the dome of St Peter's.